I love the morning time more than any other time of day. It makes my soul feel warm and fuzzy! But I don’t have a wild morning routine. As long as there’s a pot of coffee brewing and sunshine in the forecast, I’m a happy girl. 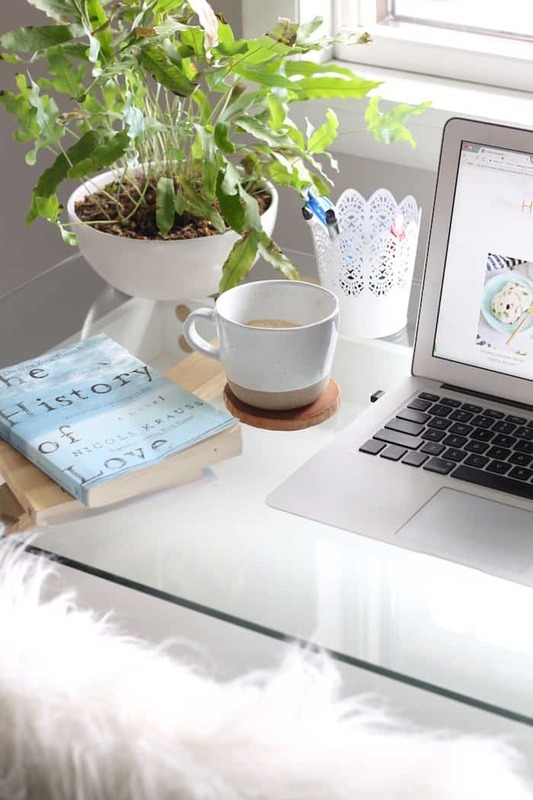 When it comes to my morning rituals, it goes something like this: wake up around 6:30 or 7am, brush my teeth, make coffee, sit at my desk and write, eat breakfast, do hair and makeup, get dressed, and leave the house by 9am. Then there’s days where it’s noon and I’m still in my PJs with flour on my nose wondering how I’m such a hot mess. I’d say the biggest factors that determine the greatness of my morning are 1) my coffee situation, 2) my bright little office space, and 3) the birds chirping. A sunny morning at my desk in peace and quiet, an espresso topped with frothy milk, and birdies singing outside is my dream circumstance. I like to get up early-ish so I have time to do a little blog work and slowly wake up. In an ideal world, I’d get up at 6am so I could have an hour to lay low and enjoy the morning calm. I don’t always get up as early as I’d like, but when I do I really savor that time. Now, I say “office” because it’s really just a desk in an unused space off our bedroom with no other office-like things around it but it’s my favorite place to be in the morning. It all started with me recognizing that doing work at the kitchen counter wasn’t resulting in my most productive self. I could hear Jeff watching TV in the next room and I felt super distracted. I craved a quiet, dedicated space with tons of light where I could sip coffee and do my writing in peace. Off our bedroom we have a slightly strange open space before the bathroom that Jeff was using as a second closet. It’s lined in windows and has some of the best southern facing light in the house, so I knew putting a desk in front of the center window would be amazing. I used to leave the house to go to coffee shops and now I can’t wait to settle into my own space in the morning. It’s such a good feeling! Now let’s talk beverages! You guys know how much I love coffee. I enjoy it daily, sometimes more than once. My usual coffee routine involves grinding organic coffee beans, smelling the ground coffee and wishing I could turn it into an air freshener for a solid minute, and then proceeding to brew said coffee. I like the smell of coffee brewing just as much as I like the taste. But guess what? Lately I’ve been gushing over espresso with steamed milk courtesy of my new Espressotoria® countertop espresso machine! I drank cappuccinos daily in Italy and Israel and always miss that experience when I come back to the states. Why not enjoy them at home?! To be honest, as much as I adore cappuccinos, the process always sounded really intimidating to me. Brewing a pot of coffee is so much easier, right? Actually, no! It takes more effort for me to make a pot of coffee than it does a cappuccino. And there’s something so elevated and treat-like about espresso drinks. I feel like I’ve been missing out on so much morning joy not having an espresso machine till last week! Now believe me when I say I am terrible with technology. It’s kind of miraculous that I have a fully functioning website. Anyone that knows me knows I’m good at being creative and communicative, not problem solving. The best thing about this espresso machine is that the only thing that separates you from a perfect cup o’ espresso with fluffy milk is the press of a button. You simply place the espresso capsule in the machine, press down the lever, pick your size, and then inhale the most beautiful scent of espresso in your cup. 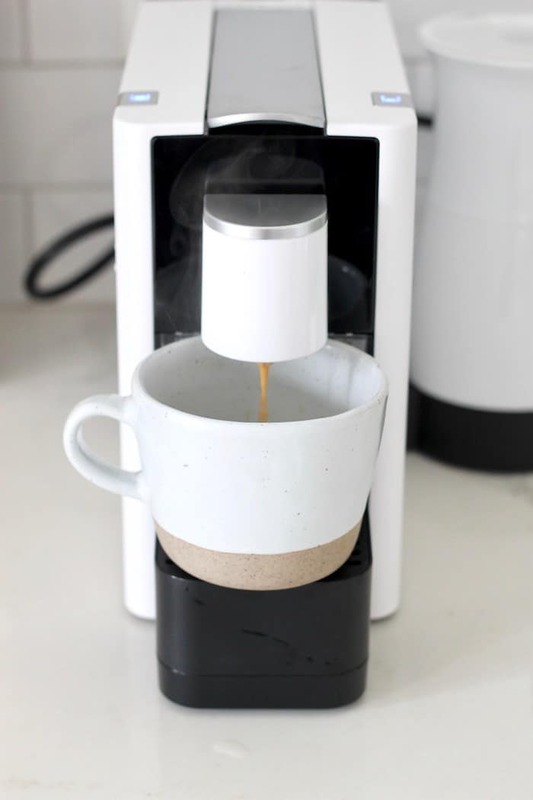 While it’s brewing, pour your milk of choice (it froths almond milk amazingly well) into the frother, put the lid on, press the “on” button, and in less than a minute you’ll have an epic froth situation. The whole thing takes less than two minutes! 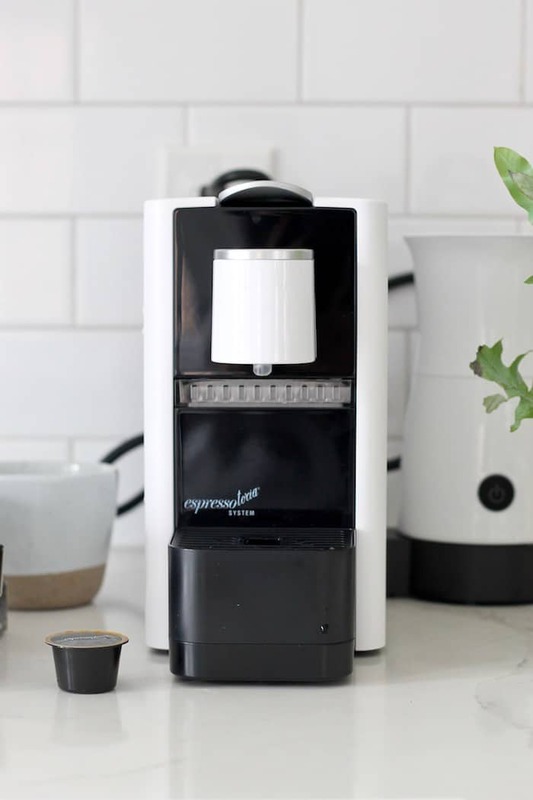 The machine has three parts: the Caprista Machine, Milk Frother, and Espressotoria® Capsules. Not only is this espresso machine total eye candy on the kitchen counter, but it’s also the most affordable machine I’ve seen. The best part is that it makes my frothy cappuccino dreams come true in the comfort of my own kitchen. I LOVE FROTH. I was hesitant about frothing almond milk because it doesn’t have much fat or protein but the milk frother turns it into warm fluffy perfection in minutes. Such a treat! The pods come in several varieties of 100% arabica beans. My favorites are the Espresso Italian Dark Roast, Brazilian Breakfast Blend, and Latte Dark Roast. They even natural Decaf Medium Roast and Organic Light to Medium Roast. Now for the fun part! 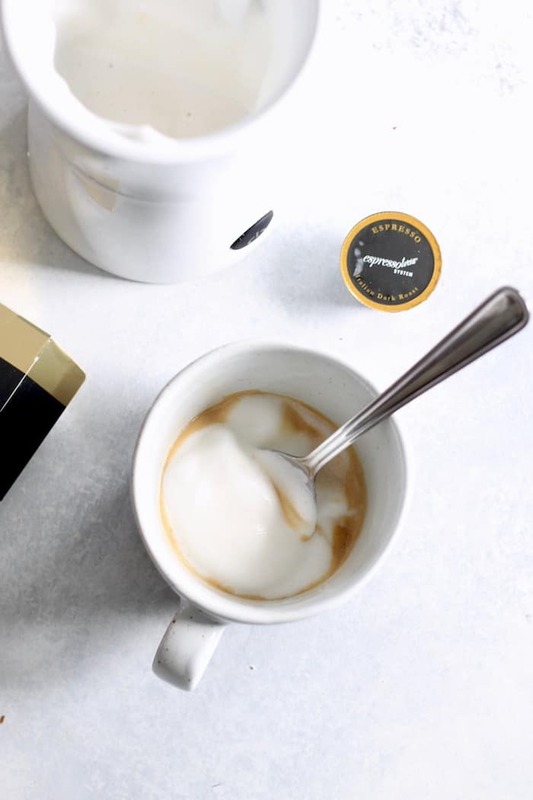 Espressotoria® and Walmart.com are teaming up for a special promotion where shoppers can buy six Espressotoria® Coffee Pod Packs and receive a FREE Espressotoria® Machine! How epic is that?! This would be the perfect little Mother’s Day present, don’t you think? Cheers to cozy mornings with even cozier espresso sips! This post is sponsored by Espressotoria®. Thanks for supporting the brands I love that make cozy Hummusapien mornings possible! I am not a coffee drinker but the way you describe it in this post made me want to start! 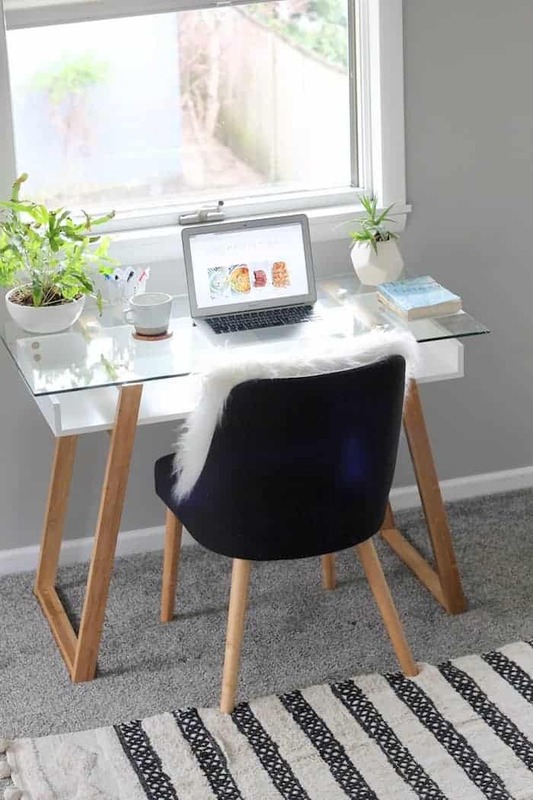 Also your little “office” looks just about perfect! I love your “office”. We live in England and the morning sunshine at our house is beautiful.. This makes me want to make an office space like this instead of my dining room table! :) Where did you get the desk and chair ? LOVE them both! Yummmmm looks divine! I’ve gone back and forth for so long on wanting an espresso machine, especially after coming back from Italy and Switzerland. But I like supporting my local farmers’ market coffee supplier. And what about the waste from the espresso pods? Any thoughts? I went through a similar thing and have purchased FAR too many lattes from Starbucks, because I prefer espresso drinks to drip coffee. When I finally decided to take the espresso plunge (like, 5 years worth of debate later) I went for a traditional machine (no pods) so I could really learn the whole process. Started with a cheaper mr. coffee machine and then upgraded to a Breville once I knew the habit would stick. I love the routine, it’s been almost a year and I’ve bought maaaaaybe 5 lattes since getting set up at home. I prefer to make my own now! For some people pods are easier though! I definitely see the appeal of espresso in 20 seconds, nothing to clean, and I’d imagine they are recyclable. With the convenience factor does come some extra waste. I don’t know how you’d get around it without having a fancier more expensive machine. I know they’re 100% recyclable, though! Your office is sooooooo cute!!! I was just talking to my husband about getting an espresso machine, but they’re so expensive. Thanks for sharing. Just ordered. It will be available for pick up on 5/3. Can’t wait to start my mornings with it! I absolutely LOVE mornings as well! 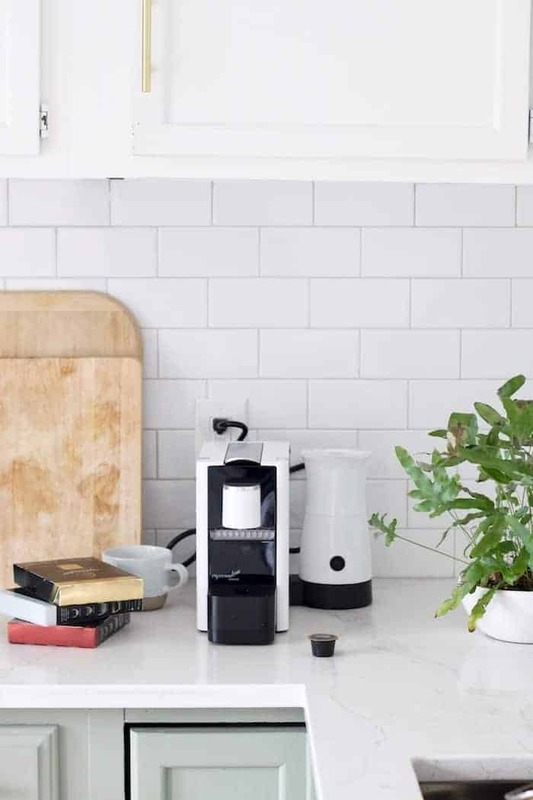 So excited for you for your new office space…I feel you with the distractions of the kitchen! And also excited about this awesome deal! Loved seeing your new office space Alexis!! It’s so, so pretty. And those cappuccinos look delish. Thanks so much for sharing! Soooo fancy ;) I feel like for me, I drink coffee on a non-daily basis, so I love the whole experience of going to one of my favorite spots, ordering a coffee, and really savoring it as I’m out and about. Always adds a burst of joy to my day. I’m with you though on the morning loving. Whenever I get enough sleep and wake up early enough that everyone else is mostly still asleep, it’s pretty amazing. Also, you mentioned wanting a coffee air freshener LOL which made me think of this AMAZING anthropologie candle called Espresso from the Boulangerie collection. Look it up, girl! Beautiful office! Are those coffee pods recyclable? Are they like a Nespresso, where you can mail them back in for recycling? Your office space looks so comfy and and so beautiful. Plus the coffee—ugh. Perfect office space. Anyways, thanks for sharing this and the photos :) Cheers to you, Alexis! Such a great office space! 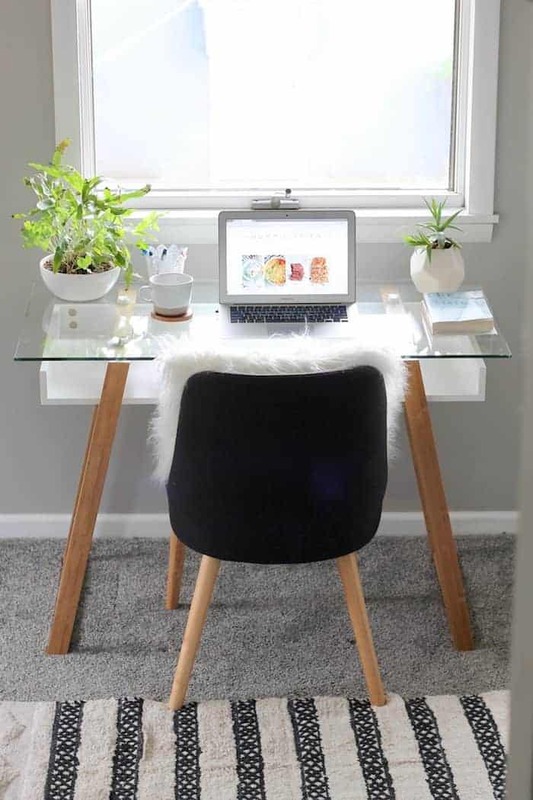 As someone who also works from home, having that dedicated space to optimize your work is so important! And I agree, coffee is a MUST. Good coffee, of course. Your little office place is so cute and adorable. I love mornings. I can enjoy the quiet and I just can feel peace. I would love to have your tiny office space. I have a similar place to read in my hometown. So, I like to sit there, read my favorite book and drink my favorite coffee- ice coffee. Do you like it? Your little office place is so cute and adorable. I love mornings. I can enjoy the quiet and I just can feel peace. I would love to have your tiny office space. I have a similar place to read in my hometown. So, I like to sit there, read my favorite book and drink my favorite coffee- ice coffee. Do you like it too? What a great office !!!! I love your office space. i want to go there and drink my favorite ice coffee. Thank you so much for sharing this post and pictures. I simply loved your office. I loved how you included nature as part of your decoration. Unfortunately I can´t afford to remodel my house this way for the moment. Does anyone know a coworking place in L.A.? I was living in Texas and I was renting an office in Ranch Office (highly recommendable btw). But now I’m moving to L.A. and I was wondering if there’s a place as good as the one I came across. Thank you. Wow, I loved how you included nature as part of your decoration. I want to go there and drink my favorite ice coffee. Thank you so much for sharing this post and pictures. I love your little white furry chair and desk setup! So very cute. This was a great post. Interior decorating seems to be your thing though. Thanks for great article. is it really your office? In addition to projecting a stylish impression among potential clients or visitors, employees find fashionable, professional chairs create an appealing work environment which increases workflow and morale. Your coffee machine is very nice, I like it’s minimalistic design. It looks really god in your office.